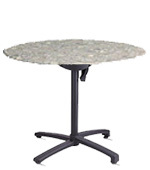 These commercial quality tabletops and bases provide a strong, attractive, highly durable, no maintenance alternative from high-priced seating units. 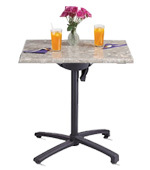 Specifically designed for the food service and hospitality industries, these environmentally correct tables are naturally impervious to salt air and chlorine. They won't rust, fade, chip or stain. 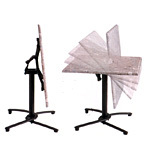 They are heat, burn, weather and scratch resistant. 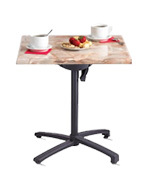 The tabletops are made of molded melamine and the optional base is made from aluminum.